This week, Nigerian President Muhammadu Buhari presented a record 7.29 trillion naira (N) ($23.97 billion) 2017 budget to lawmakers, representing an increase of over 20 percent of the 2016 allocation. The 2017 budget vastly increases capital expenditure while seeking to reduce new recurrent expenditures compared to the 2016 budget. This expansion seeks to pull Africa’s biggest economy out of its first recession in 25 years. Nigeria has already cut its 2017 growth forecast to 2.5 percent and its economy contracted in the first three quarters of this year due to the collapse in global oil prices and plummeting oil output due to the insurgency in the Niger Delta, Nigeria’s main oil-producing region. Crude oil sales account for approximately two-thirds of government revenue. The figures below explore the proposed new budget. Following a stated desire to increase investment in electricity and transportation infrastructure, President Buhari has proposed capital expenditures of N2.24 trillion ($7.3 billion). Accordingly, the Ministry of Power, Works, and Housing has been allocated N529 billion ($1.74 billion) and the Ministry of Transportation has been allocated N262 billion ($862 million). In order to continue the fight against Boko Haram and the insurgency in the Niger Delta, the Ministry of Defense has been allocated N140 billion ($461 million). President Buhari has allocated more to the oil-producing Niger Delta region and the troubled northeast: The Ministry of Niger Delta Affairs has been allocated N33 billion ($108 million); the Niger Delta Development Commission—a federal government agency with the sole mandate of developing the oil-rich Niger Delta region—has been allocated N61 billion ($300 million); an additional N65 billion ($213 million) has been allocated for the militant’s amnesty program; and the Presidential Committee on the North East Initiative has been allocated N45 billion ($148 million). The Universal Basic Education Commission, tasked with ensuring primary education for every Nigerian, has been allocated N92 billion ($302 million). Finally, the Special Intervention Fund, used to fund everything from school feeding to conditional cash transfers programs, has been allocated a hefty N150 billion ($492 million). As per the historical norm, non-debt recurrent expenditure is once again higher than capital expenditure. Total recurrent expenditure is budgeted at N2.9 trillion ($9.5 billion), with the largest allocations for the Ministry of the Interior, Ministry of Education, Ministry of Defense, and Ministry of Health. The Ministry of the Interior is tasked with care of the Nigerian Prison Service, the Nigerian Immigration Service, the Security and Civil Defense corps, the Federal Fire Service, and other agencies. The lion’s share is taken up by wages and pensions. In the wake of a raft of doctors’ strikes, scandals about nonpayment of soldiers’ wages, and strikes over unpaid teachers’ salaries, the federal government has increased wage allocations for the Ministries of Education, Defense, and Health. About N1.66 trillion ($5.44 billion) will be used to service existing debt obligations. 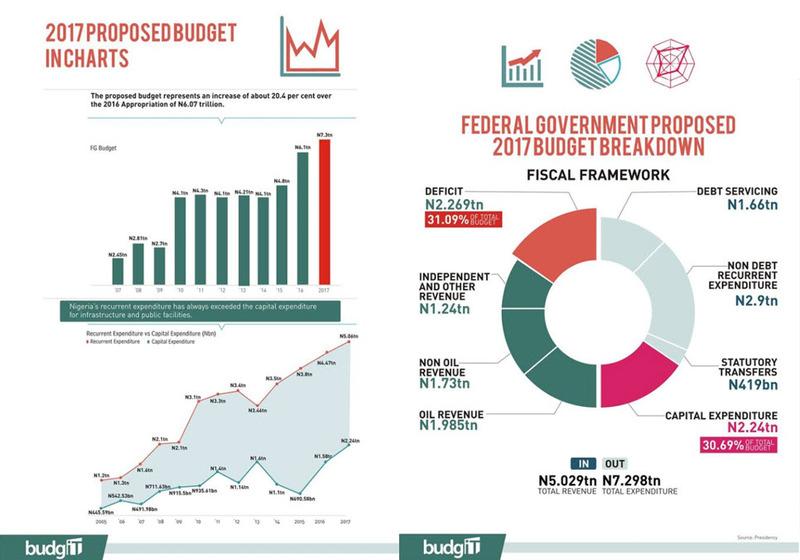 To fund the budget, the federal government is projecting N4.9 trillion ($16 billion) in revenue. The oil sector is expected to generate N1.985 trillion ($6.5 billion), while N1.73 trillion ($5.67 billion) is expected from the non-oil sector and N1.23 trillion ($4.03 billion) is expected from other sources of revenue. The bulk of non-oil revenues comes from the corporate income tax while independent revenue includes surcharges on luxury items, imports, fees, and excise duties as well as recoveries of looted funds. In terms of the deficit, N1.252 trillion ($4.1 billion) of the N2.36 trillion ($7.73 billion) deficit will be financed by domestic borrowing, while the other N1.067 trillion ($3.5 billion) will come from external borrowing. 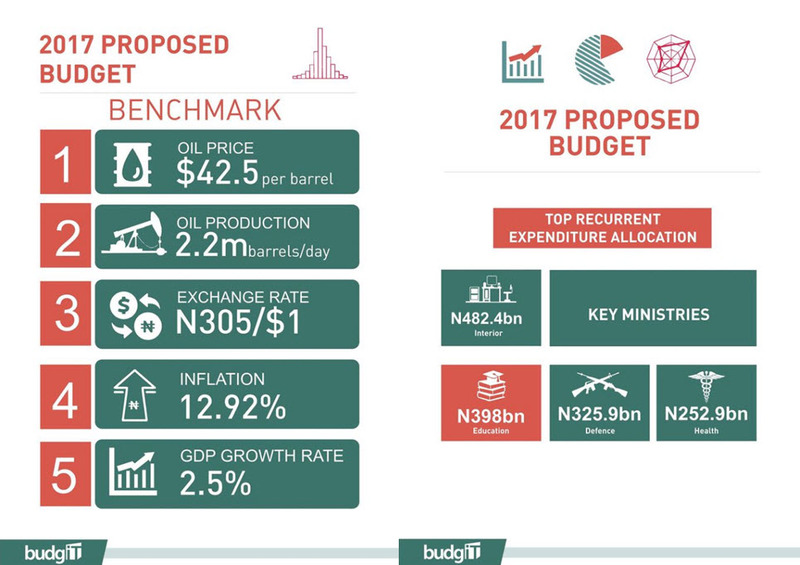 In its calculations, the federal government expects a benchmark of $42.5 per barrel of oil, an exchange rate of N305 to the dollar, and oil production of 2.2 million barrels per day. Current conditions are slightly at odds with these figures: Brent crude oil is steady at $56 per barrel, the exchange rate is hovering at N314 to the dollar, and Nigeria’s current oil output is down to around 1.9 million barrels per day. The budget will now be read by the National Assembly and debated over, before being returned to the president to be signed into law. While the president is hoping for a speedy process, the 2016 budget only officially became law in May following months of deliberations between the federal government and the senate.